You may be wondering whether a training urinal is just another piece of baby gear that will end up in the junk pile with the rest. While some parents love training urinals, others think they are a complete waste of time. Experts have all sorts of theories and make all sorts of promises about how to potty train as fast as possible. Ultimately, however, your child will go at their own pace and all you can do is help the learning process go more smoothly. Once they’re ready, products to make potty training easier can make a big difference as you work toward a diaper-free future. Items like kid-size potties, a watch to remind them when it’s time to “go,” and disposable seat liners for public toilets could be the answers to your potty training prayers. Children learn by imitating their parents. If your little boy has seen Dad pee standing up then he will probably want to go to the toilet the same way. Your little boy will be much more enthusiastic about potty training if he can go to the toilet the same way that Dad does. Whether you like it or not, one day your little boy is going to pee standing up. He might as well learn how to aim while young. It is much less embarrassing to clean up after a boy who is potty training than one who is much older. Everyone is different and some boys take to potty training a lot quicker if they are able to pee standing up. While a urinal is a nice to have item it is not essential and you will still be able to potty train your little boy using a regular potty. 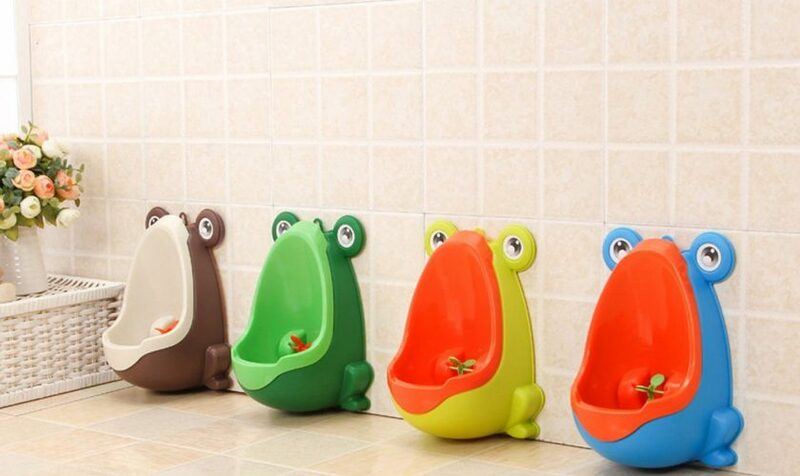 Toddler urinals come in many types, from very simple to a stand alone flushing urinal for your toddler’s use. 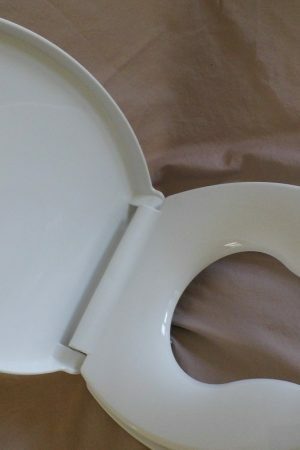 The simplest and cheapest toddler urinals attach to your regular toilet and either lift up to protect the toilet tank and seats while deflecting the stream of urine into the toilet bowl, or attach to the side of the toilet at your child’s height and must be emptied into the toilet bowl by an adult. However, you can also choose a separate child-size urinal that either sets up on a stand or is attached to your wall. 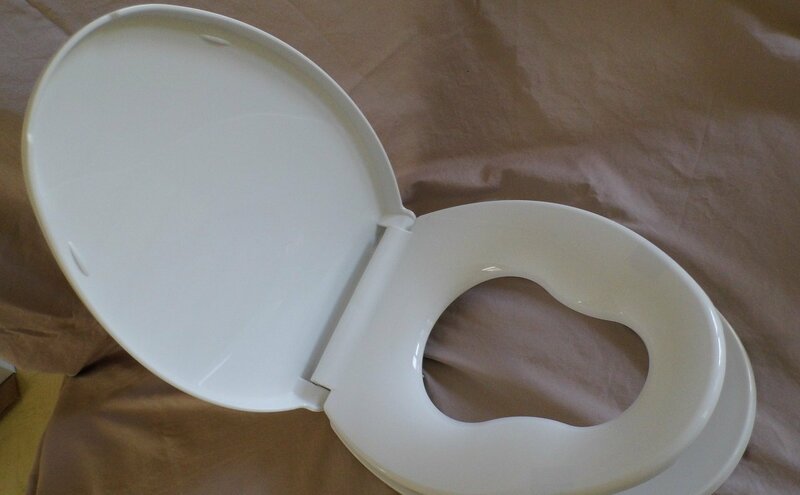 Some can actually be flushed, but all will still require emptying and cleaning. This is the most basic type of urinals for kids. Generally, it is one piece of molded plastic that has a hook at the back of the urinals. You use the hook to attach the urinal to your toilet. It is quite easy to install and use and does not have a lot of features. Just what the baby needs to do what daddy does and how he does it. Once your baby is done with fighting his imaginary fires, you can unhook the urinal potty and empty it. If the baby is old enough, they can even empty it themselves. Pretty simple. The benefits attached to the use of this potty training urinal include the fact that it is easy to use and also easy to empty. It does not have a lot of pieces so that also makes it much easier for you to clean without the hustle of trying to get to the nooks. The basic design also comes with a couple of flaws that you should be aware of before you make the purchase. The potty training urinal has to be removed every time an adult wants to use the toilet. Chances are you might have to make a couple of dramatic runs to the bathroom when your baby gets there and finds you forgot to replace the urinal before they do it all over the floor. Also, the potty can only be mounted at the height of the toilet so it might take some time before the kid is able to use it comfortably. The suction cup stand up potty training urinal is slightly advanced and has a better user experience because it has more features it offers the baby. At the rear of the urinal there is a series of suction cups. 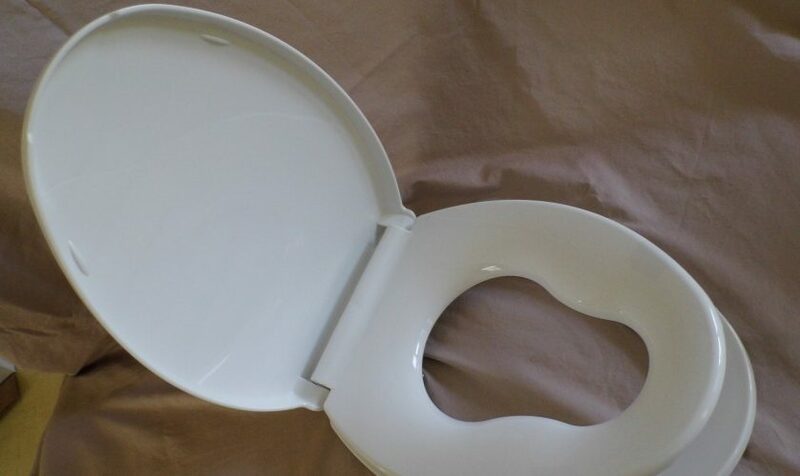 The cups allow you to mount the potty at any height and better yet, in a variety of surfaces. 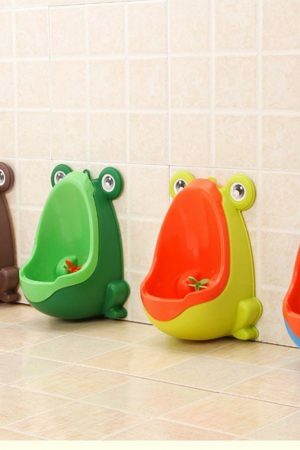 It makes this urinal for kids highly portable. In most cases, the product comes in two different pieces. One is the base station that connects to the wall and the other is a plastic urinal that detaches for easier emptying. Most of the benefits that are attached to this potty training urinal is courtesy of the suction cups. One of these is the fact that you can mount the potty at any height so your baby does not have to wait until they’re tall enough to be able to use the product. You can also attach it to different surfaces making it more portable. Because it has more pieces, it is harder clean and the use of suction cups is slightly worrying because they are not the best at clinging on surfaces. 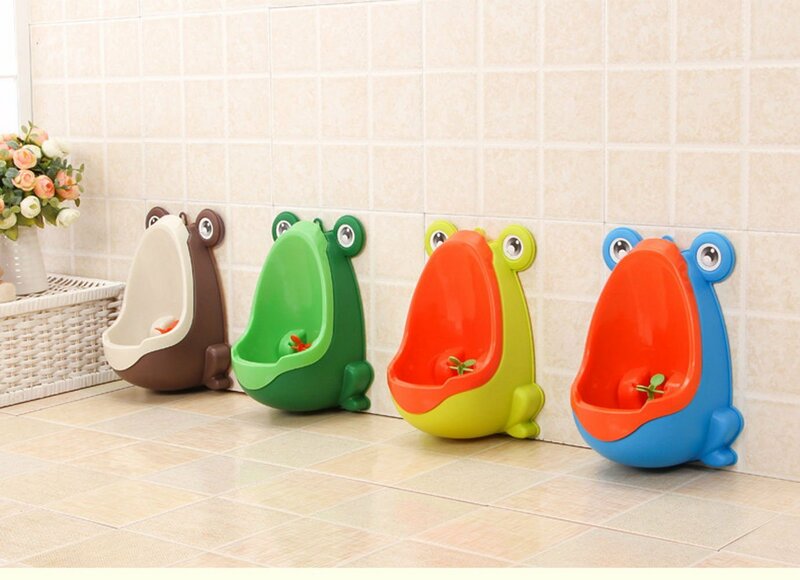 But they’re still great urinals for toddlers. Of all the urinals for kids, the standing training urinal has to be among the best there is. It does come with premium price tag but plenty of benefits to offer as well. The standing training urinal is the best option if you want to give your baby the most lifelike urinal experience during the training experience. All standing training urinal have a larger size and because of this, they have a larger urinal catcher area. Ideally, that would mean that there is a lower chance that the baby will miss and hence less cleaning for you. Because they can support themselves, they can also be used almost anywhere as long as there is a flat surface. A good number of parents prefer to use them outdoors. The standing urinals for kids happen to be the most stable training urinals and have a larger aim for the growing boy. The fact that they can be used even in the outdoors is also a huge bonus. However, the size comes with a downside since it means that it takes up more space in your bathroom. It is also the most difficult of the three to empty. Girls tend to be potty trained about three months earlier than boys, but this isn’t a hard-and-fast rule. If she has older siblings, she may learn earlier than a first-born. One of the most effective potty training tips, especially for girls is to take them underwear shopping. As with boys, underwear that has cartoon characters on it works the best. Girls also have a stronger desire then boys to stay clean and not wet their underwear, so it’s very common for a girl to tell her mommy if she needs to go right from the start. Choose your time carefully. It’s best to avoid starting training when big changes are coming up, such as starting at nursery or the arrival of a new sibling. She may feel too overwhelmed to tackle a new challenge. Waiting until she’s settled down will help to get potty training off to the best start. If your child has started saying “no” to everything, bear in mind that it’s just a phase. She’ll get through it, so you might want to delay potty training until it’s over. What will I need to potty train girls? The first step is to buy a potty. 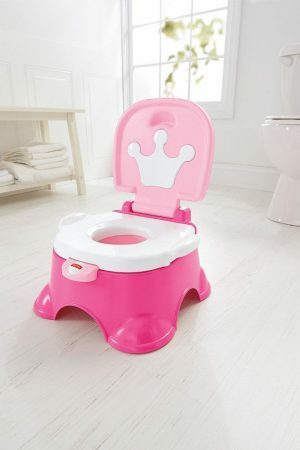 Involve your little girl in picking a potty she likes – this will help her to enjoy sitting on her potty. She may feel more secure on a potty than on a normal toilet and it means she can easily get off and on. Books and DVDs about potty training will also help to make it a fun learning experience for her. If she is ready to get rid of nappies then take her shopping for her first pair of knickers. Let her pick the ones she wants and make it a big event for her, celebrating how much of a big girl she is. How should I start potty training? Make sitting on the potty a part of your child’s daily routine, perhaps when dressing in the morning and before the evening bath. Don’t expect her to sit there for long; at first she may only stay there for a very short time – you are simply getting her used to the potty. Toddlers learn by imitation, so letting her see you go to the toilet will make things a lot easier for her. Obviously she may ask why Mummy sits down and Daddy stands up, so be prepared to talk about the differences between boys and girls. According to Teri Crane, author of popular toilet training book “Potty Train You Child in Just One Day,” adults should always be clear in their communications with their daughters about potty training, and consistent in their language and schedules. Crane told diaper and pull-up company Huggies that many little children think concretely. In other words, if you ask your daughter if she wants to go to the bathroom, she may think you are asking if she wants to walk in there, not if she needs to use the toilet. Be thoughtful of the language you use and understand that it may take awhile for your daughter to realize what “going to the bathroom” means. Many little girls want their parent, guardian or caregiver to stay with them when they go to the bathroom, and you never want to leave a child in the bathroom alone. FamilyDoctor.org, the website of the American Academy of Family Physicians, suggested that adults read or talk to their daughters to help them relax and feel comfortable on the toilet. Some girls may end up feeling anxious or get off the chair if you leave them alone, and many little ones may need encouragement. 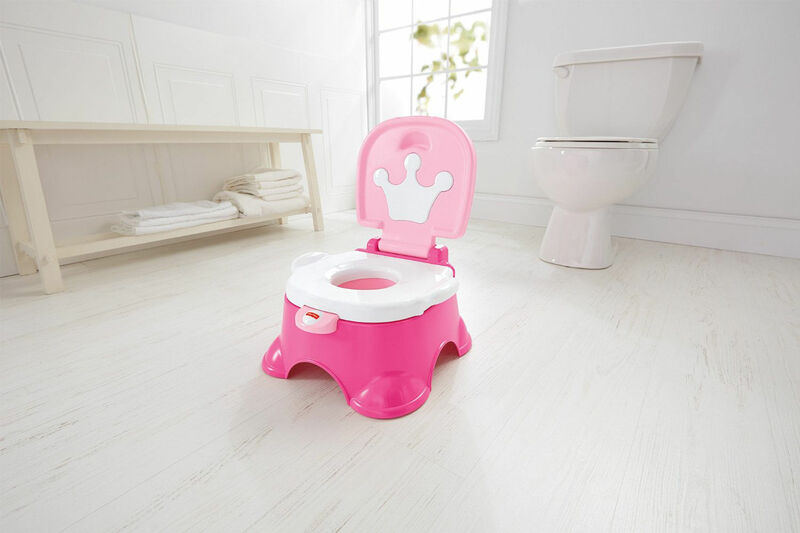 The ideal age to start potty training a girl is between 18 and 24 months, this is the period girls start to get a stronger desire to be clean, therefore showing more interest in the potty. It’s common for older kids, girls aswell as boys to be afraid to release bodily fluids and solids. This can be quite frustrating for the parents, but it is important to hide this frustration from your child. All you can do in a situation like this is to be encouraging and very supportive. It’s times like this when making a huge deal out of every success can do a lot of good to the training process. Older girls can experience conflicts between wanting to be a baby and wanting to be a big girl, which can cause them to have fits and tantrums even over the most basic instructions. Girls are harder to train once they’ve reached reasoning age and begin to manipulate rewards. With all this being said, teaching girls how to use the potty is still easier than training boys. Personally I hope these tips will aid you in successfully training your little daughter and get rid of diapers for good. He may be ready at the age of 18 months, or it may not be until he is four years old. Boys tend to stay in nappies for a few months longer than girls. If he has older siblings, he may learn faster than if he was a first-born. If your son is ready to start, focus on timing. If he’s just changed his nursery or has a brand new sibling, it may not be a good time. He may be less open to change, or feel too overwhelmed to tackle this new challenge. 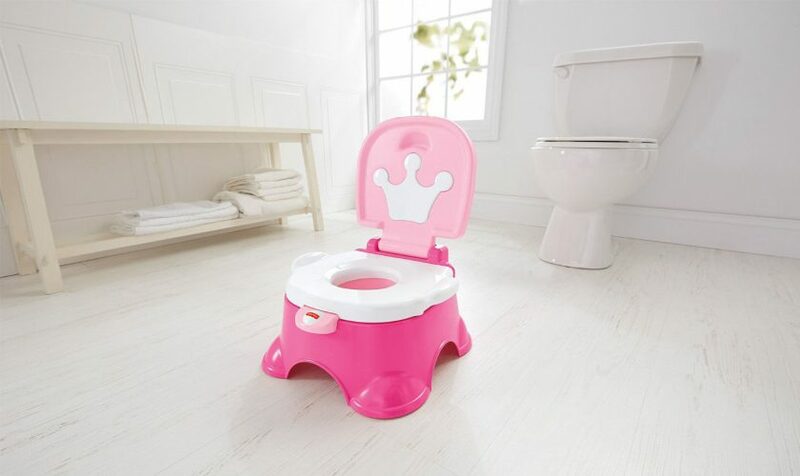 Waiting will ensure that you get potty training off to the best start. Let your child peruse your home…naked, or in just a T-shirt. Because he’s not wearing a diaper or underwear, he’ll have no place to put his pee or poop; he needs to put it somewhere—in the toilet would be a good idea! When he does put it in the potty, make sure you both have a look (yuck, I know, but the visual is important.) Make flushing a huge deal by pointing at the swirling water and acknowledging the cool whooshing sound. As eager as you may be to ditch the diapers, many moms stress the importance of delaying toilet training until your son is ready. Amanda G. shares, “There really is no right age. Just keep your eyes open for signs of readiness.” Jessica D. agrees: “My little boy is a little over 3-and-a-half, and he just now decided he wanted to potty train. . . . He will do it when he is ready; just be patient and give lots of encouragement.” Common signs of potty-training readiness (which generally appear between age 2 and 3) include asking questions about the bathroom and toilet, staying dry for longer periods of time (indicating stronger bladder control), wanting to wear “big kid” underwear, or telling you when he’s soiled a diaper. Stay calm and remember that it’s all part of the process. The more he uses the potty, the better he’ll be at it. Dress him in loose-fitting clothes that he can easily take off. But if he still still wets his pants, don’t overreact or punish him. Nothing can disrupt potty training faster than making a child feel bad for having an accident.